Visit www.FloridaPythonCollection.com to learn more about the collaboration and to stay up-to-date on the latest happpenings and new arrivals. 530 Burns Gallery is pleased to announce Nikki Sedacca for Dusty “Wildman” Crum, a line of luxury python snakeskin accessories designed by Nikki and made in Florida. The goal of the collaboration is to raise awareness of the dire threat invasive Burmese pythons pose to humans and native wildlife of Florida’s Everglades. The show will highlight the efforts made by Dusty “Wildman” Crum and members of the Python Elimination Program to restore the Everglades’ delicate ecosystem. On Friday, April 6th from 6 to 9 pm, 530 Burns Gallery will host an opening reception featuring wall hangings of snakeskins captured by Wildman and tanned by Floridian artisans, as well as select samples of luxury snakeskin jewelry and accessories from the new collection. Wildman is developing a fund for a portion of the proceeds to go directly to the python hunters who are putting in long hours of work at minimum wage. Time is of the essence. “With any invasive species control or eradication program it is critical to begin control efforts before the animal’s population increase reaches a rapid growth rate called an inflection point. Beyond that point control measures may not be successful,” said Manley Fuller, President of the Florida Wildlife Foundation. Burmese pythons were never meant to live in Florida’s Everglades. Originating in Southeast Asia and accidentally or intentionally released by pet owners, the invasive species has thrived and subsequently decimated Florida’s native wildlife -- marsh rabbits, gray squirrels, domestic cats, raccoons, bobcats, white-tailed deer, limpkin, white ibis and even the American alligator. With an insatiable appetite, no natural local predator, the ability to travel long distances, and females found carrying up to 100 developing eggs, the python could cause catastrophic and irreversible damage to the Everglades. After years of experimentation with different programs, the Python Elimination Program proved to be a great success due to skillful hunters like Wildman. The program now spans the Everglades in Miami-Dade, Broward, and Collier counties. “The speed with which hunters are finding and eliminating these destructive snakes showcases not only their dedication to the effort, but also the enormity of this invasive predator problem in the Everglades,” said South Florida Water Management District Governing Board Chairman Dan O’Keefe. Since the start of the Pilot Phase of the program on March 3, 2017, the hunters have eliminated about 900 pythons -- each marked on a live map available to the public. Responsible for capturing many pythons including one of the largest snakes at 16 feet, 10 inches and about 130 pounds with 73 eggs in its belly, Dusty “Wildman” Crum has a well-earned reputation as a protector of the Everglades. An environmentalist at heart, Wildman’s goal is to restore a healthy ecosystem and protect the beauty for which Florida’s Everglades are known. A native Floridian who took part in the 2013 Python Challenge, Wildman felt a strong calling to enter when the Python Elimination Program began its search for hunters. By day, Dusty owns Orchid Envy with Natalee Mckinney in Venice, Florida. His passion for growing orchids led him to meet orchid aficionada and jewelry and accessory designer Nikki Sedacca. 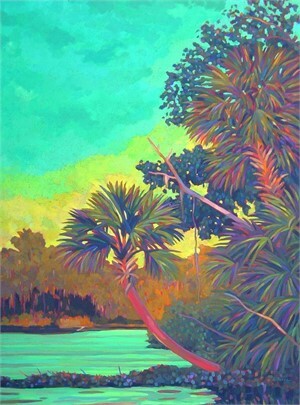 Sharing in their admiration for the beauty of Florida’s landscape and native wildlife, Sedacca and Wildman see this collection as an important avenue to highlight both the gravity of the threat to the Everglades and the strength and beauty of the Burmese python amidst this tragedy. 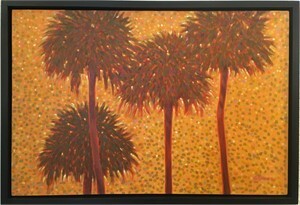 Glades to Galler will feature works by Gary Borse- the Florida Landscape Painter. 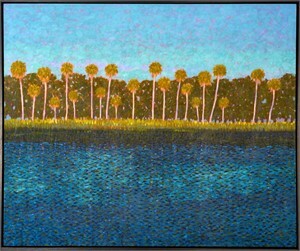 Visit www.FloridaPythonCollection.com to learn more about the collaboration and to stay up-to-date on the latest happpenings and new arrivals. 530 Burns Gallery is pleased to announce Nikki Sedacca for Dusty “Wildman” Crum, a line of luxury python snakeskin accessories designed by Nikki and made in Florida. The goal of the collaboration is to raise awareness of the dire threat invasive Burmese pythons pose to humans and native wildlife of Florida’s Everglades. The show will highlight the efforts made by Dusty “Wildman” Crum and members of the Python Elimination Program to restore the Everglades’ delicate ecosystem. 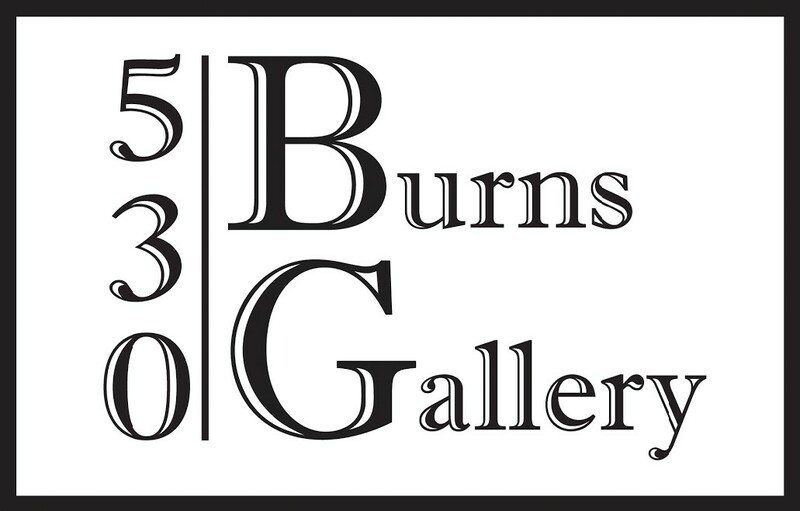 On Friday, April 6th from 6 to 9 pm, 530 Burns Gallery will host an opening reception featuring wall hangings of snakeskins captured by Wildman and tanned by Floridian artisans, as well as select samples of luxury snakeskin jewelry and accessories from the new collection. Wildman is developing a fund for a portion of the proceeds to go directly to the python hunters who are putting in long hours of work at minimum wage. Time is of the essence. “With any invasive species control or eradication program it is critical to begin control efforts before the animal’s population increase reaches a rapid growth rate called an inflection point. Beyond that point control measures may not be successful,” said Manley Fuller, President of the Florida Wildlife Foundation. Burmese pythons were never meant to live in Florida’s Everglades. Originating in Southeast Asia and accidentally or intentionally released by pet owners, the invasive species has thrived and subsequently decimated Florida’s native wildlife -- marsh rabbits, gray squirrels, domestic cats, raccoons, bobcats, white-tailed deer, limpkin, white ibis and even the American alligator. With an insatiable appetite, no natural local predator, the ability to travel long distances, and females found carrying up to 100 developing eggs, the python could cause catastrophic and irreversible damage to the Everglades. After years of experimentation with different programs, the Python Elimination Program proved to be a great success due to skillful hunters like Wildman. The program now spans the Everglades in Miami-Dade, Broward, and Collier counties. “The speed with which hunters are finding and eliminating these destructive snakes showcases not only their dedication to the effort, but also the enormity of this invasive predator problem in the Everglades,” said South Florida Water Management District Governing Board Chairman Dan O’Keefe.Since the start of the Pilot Phase of the program on March 3, 2017, the hunters have eliminated about 900 pythons -- each marked on a live map available to the public. Responsible for capturing many pythons including one of the largest snakes at 16 feet, 10 inches and about 130 pounds with 73 eggs in its belly, Dusty “Wildman” Crum has a well-earned reputation as a protector of the Everglades. An environmentalist at heart, Wildman’s goal is to restore a healthy ecosystem and protect the beauty for which Florida’s Everglades are known. A native Floridian who took part in the 2013 Python Challenge, Wildman felt a strong calling to enter when the Python Elimination Program began its search for hunters. By day, Dusty owns Orchid Envy with Natalee Mckinney in Venice, Florida. His passion for growing orchids led him to meet orchid aficionada and jewelry and accessory designer Nikki Sedacca. 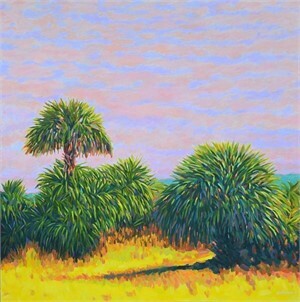 Sharing in their admiration for the beauty of Florida’s landscape and native wildlife, Sedacca and Wildman see this collection as an important avenue to highlight both the gravity of the threat to the Everglades and the strength and beauty of the Burmese python amidst this tragedy. ● For more information on the Python Elimination Program led by South Florida Water Management District Governing Board:https://www.sfwmd.gov/our-work/python-program ● View the live tracking map: https://www.eddmaps.org/florida/distribution/viewmap.cfm?sub=20461 Glades to Galler will feature works by Gary Borse- the Florida Landscape Painter.